Founded as a family firm in 1878, Dundas Fyfe has long been part of the Motherwell community. Generations of families have trusted us to provide the care and support they need. We are able to take care of every aspect of funeral planning and arrangements, from guiding you through what needs to be done, to helping you create a fitting memorial. Our supportive, experienced staff are available at all times, and are able to provide whatever level of support you need. From planning a service that’s right for you and your family, to helping you choose the most fitting memorial masonry, we can help you through this difficult time. We are now part of the Scotmid family, so have the support of an extensive network of suppliers, ensuring that whatever you need from us can be arranged. You can keep up to date with what’s happening within Dundas Fyfe Funeral Directors by reading our latest newsletter. We’re members of the National Association of Funeral Directors (NAFD), the association represents the funeral profession at all levels of Government on legislative matters and campaigns on issues affecting not only funeral directors, but also bereaved families too. They provide informed opinion to Parliamentarians, Government agencies and consumer groups on all funeral matters. We’re also members of The Funeral Planning Authority (FPA) is an organisation set up by the industry to regulate providers in the UK pre-paid funeral plan industry. Our primary aim is to ensure providers that are registered with the FPA are operating in a manner that will result in customers getting the funeral they have paid for when it is needed. 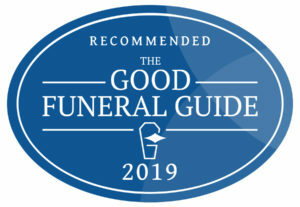 We’re proud to be recommended by The Good Funeral Guide, who are wholly independent of the funeral industry, and is dedicated to supporting, empowering and representing the interests of dying and bereaved people living in the UK. We’re members of the Humanist Society of Scotland, they were formed in 1989 in response to a rising demand for a nationwide Scottish organisation that was open to all. Humanist Society Scotland is part of a UK, European and wider international movement of people and organisations. In Scotland, Humanist Society members have a clear vision of a secular Scotland, and the activities that Humanist Society Scotland can pursue to achieve that end.